As a subconsultant, Fickett was retained to provided inspection support and inspection personnel to conduct a fracture critical inspection of the Kolekole Stream Bridge, located on the Island of Hawaii. Due to an equipment breakdown, the bridge was not able to be inspected via HDOT’s standard methods of using an under bridge inspection vehicle (UBIV). HDOTs deadline for inspection did not allow them to repair the UBIV in time for inspection, so alternate methods of inspection were required. HDOT recognized that rope access methods were a viable option and contacted several firms to seek availibility. Fickett’s responsiveness and ability to mobilize to Hawaii in a short timeframe allowed for a successful completion of the inspection without missing the inspection deadline. 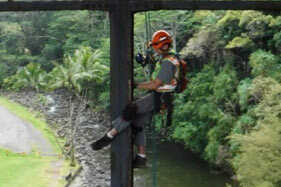 While on site, Fickett used SPRAT rope access techniques to perform the inspection. 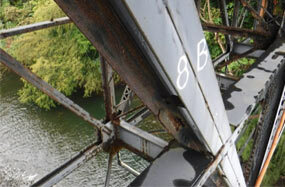 The inspection was conducted in accordance with the AASHTO Manual for Bridge Element Inspection, First Edition, 2013. 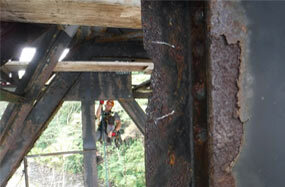 Inspection findings and photos were submitted to the client to prepare the bridge inspection reports.